Back in September at the International Broadcasting Convention 2012 (IBC) in Amsterdam and at Cloud Gaming USA 2012, Playcast Media, one of the world’s leading cloud gaming service providers, announced an agreement with NVIDIA to run its streaming service on the NVIDIA GeForce GRID cloud gaming platform, and that the first implementation will be done for the Bouygues Telecom Bbox games cloud gaming service in France. 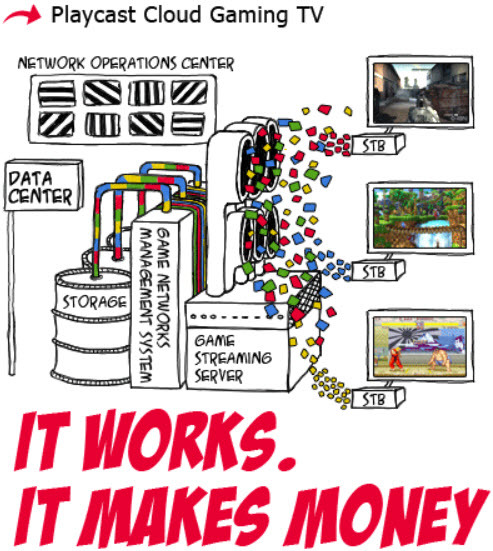 Playcast’s patented virtualization technology enables a cost-effective cloud gaming service solution for IPTV providers. The cloud gaming service with French triple-play service provider Bouygues Telecom will change the way AAA PC video games are played in France. Utilizing Playcast’s streaming technology running on NVIDIA’s GeForce GRID, the service will allow Bouygues Telecom's 1.3 million subscribers to access and play next-gen video games from the world’s major games publishers through Bouygues Telecom users' devices like PCs, Macs, Smart TVs, STBs, tablets and smartphones running Playcast’s on-demand cloud gaming service. NVIDIA GeForce GRID allows gaming-as-a-service providers to stream the latest, most sophisticated games to virtually any connected device – including TVs, smartphones and tablets running iOS and Android – without the lag that hampers current offerings. 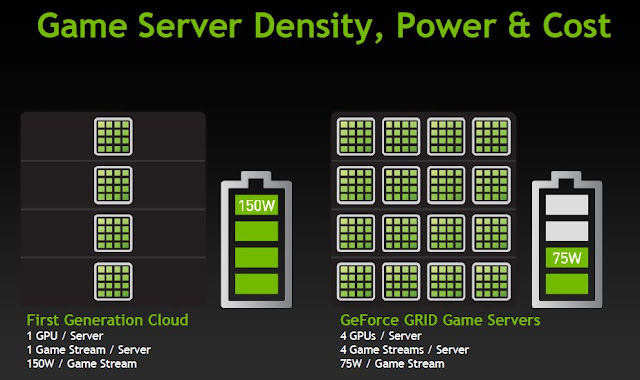 With the GeForce GRID platform, providers can deliver the most advanced visuals with lower latency, while incurring lower operating costs, particularly related to energy usage. Playcast also announced other technology partnerships with some of the largest companies in the set-top market: Cisco, Pace and AirTies which represent a total new install base of over 100 million households worldwide on top of the existing partnerships with Samsung and Sagem. The partnerships include an integration of Playcast’s streaming technology with the set-top boxes manufactured by these companies which ensure that the world's best games can be instantly streamed to cable and IPTV subscribers around the world. Playcast says that they provide the first AAA gaming-on-demand technology for cable and IPTV services in the world. The proven Playcast system uses a proprietary new technology to process off-the-shelf PC games and distribute their audio and visual output as a regular video stream to any ordinary cable and set-top on-demand boxes like those manufactured by Samsung, Sagem, Cisco, Motorola, Pace and AirTies. Playcast video game partners include renowned publishers such as Activision, Warner Bros. Interactive Entertainment, Disney Interactive Studios, Atari, Capcom, Codemasters, SEGA, THQ and more. "Game developers have long relied on consoles, PCs and mobile devices to bring their games to consumers. But cloud gaming, and more specifically, our technology, changes that model," said Guy De Beer, Playcast Media CEO. "These new technology partnerships are great news for cable providers. Now they too can get in on the game and deliver some of the world's most popular gaming content directly to subscribers around the globe." Playcast’s cloud gaming TV service brings the world's major video games brands as a managed streaming service to TV operators, and is integrated as a software application on existing set-top boxes and other video-enabled connected devices. The service is embedded into the TV lineup, just like another video channel on Pay-TV platforms. Playcast already has a lot of experience providing cloud gaming services for telecom companies. Apart from French Bouygues Telecom, they also provide their cloud gaming solutions to South Korean Cable TV Operator CJ HelloVision, Singapore's SingTel with their ESC cloud gaming service, and Portugal Telecom's MEO Jogos cloud gaming service. Playcast is also in talks for providing their cloud gaming service to US telecom carriers like AT&T, Verizon and Time Warner Cable. By now Playcast has access to more than 800,000 households with 11% of the households that have been exposed to the service performing a monthly subscription. They plan to reach 2,000,000 households by the end of 2012.